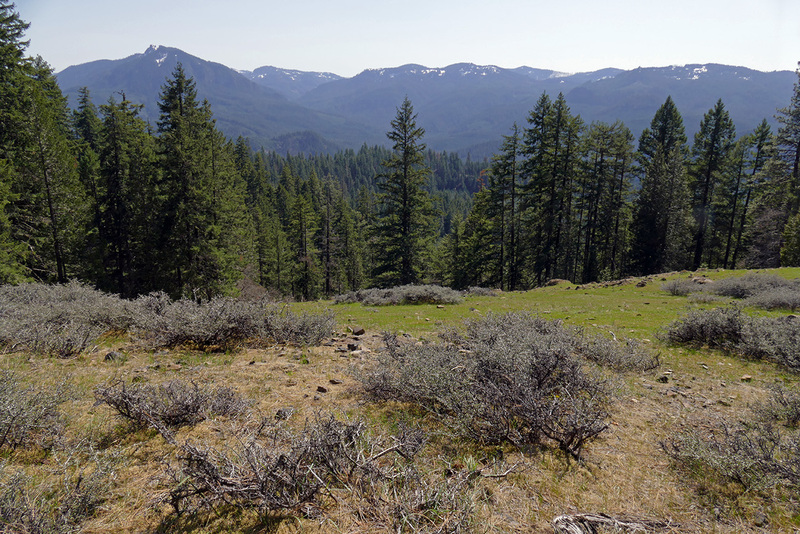 On April 22nd, John Koenig and I went back down to Rigdon to continue looking at meadows we hadn’t visited before. This time we chose several near Youngs Rock Road 1929. One small opening sitting atop a ridge off of Road 423, an apparently little-used logging road, had intrigued us. There didn’t seem to be much of a reason for an open spot in the woods there. This was my first day playing with the free Avenza mapping app I’d put on my fairly new iPhone. I had downloaded (again for free!) all the USGS quad maps for the area, placing them in a folder together on the phone so they’d be connected. I had also spent some time the night before looking at the Google Maps aerial view of the area on the phone while I was connected the night before. We had to find the spot along the road to park at and follow a ridge through woods to the hidden meadow. The GPS on the phone worked perfectly with the maps and aerial view to show me exactly where we were and where we were going. This is even better than my old GPS! An interesting fungus that seems to attack only pink microsteris. The meadow itself was not terribly exciting, with no view, but it was quite early in the season, so little was in bloom. It looked like there might be more of interest later in the season, including some unexpectedly seepy spots with developing monkeyflowers and rosy plectritis. Certainly, deer seemed to like this meadow. We noticed some sickly looking little plants that turned out to be annual phlox or pink microsteris (Microsteris gracilis) with some sort of fungus that caused orange spots on the undersides of the leaves. The affected plants look paler and more elongated than the healthy individuals. We have seen it in a number of different places since then, including at both other meadows later in the day. 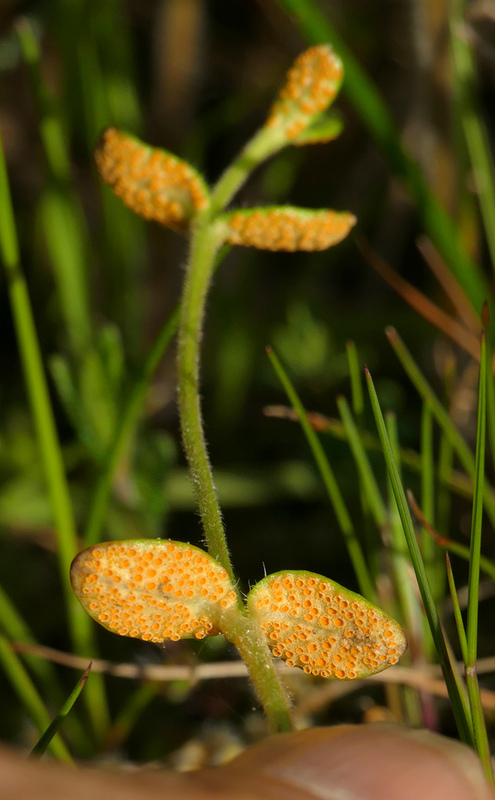 Other plants of the same species were infected by a something else, possibly another fungus, that caused them to appear covered with white hairs. Only a close look with the hand lens revealed the true nature of the fuzz. I wonder why this species was having such terrible luck. In the woods on the way back to the truck, we admired some very large sugar pines (Pinus lambertiana) as much as 4′ in diameter. A couple were actually dead, thick pieces of puzzle-piece bark piled up at the base of their decaying carcasses. 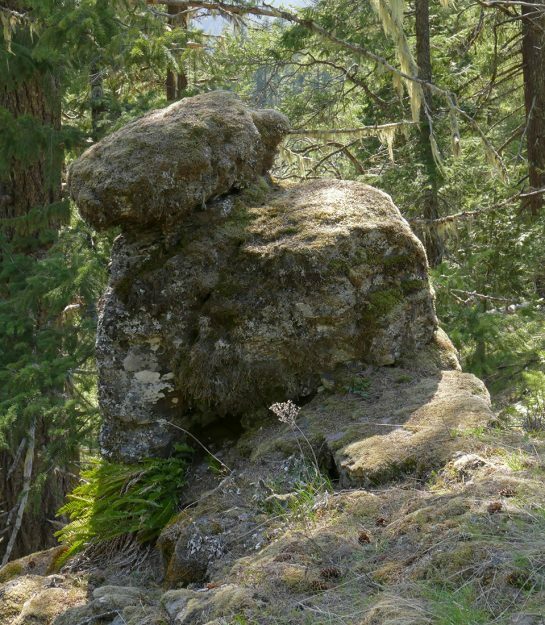 John and I debated over whether this rock formation at the bottom of Buckbrush Meadow looked more like a bear or a pika. What do you think? Returning to Youngs Creek Road, we then walked up a very old abandoned road for a short way through the woods. I had wondered about this road on previous trips past it on the way to Moon Point. Small trees were retaking the road, but we cut across the forest and very quickly came to a large sloping meadow with a great view to the south (thanks again to the maps and aerial view on the phone making this bushwhacking so easy!). I had seen this meadow on Google Earth and wondered about it for a long time. As I suspected from the grayish dots on the aerial images, it was covered with buckbrush (Ceanothus cuneatus), so we readily dubbed it “Buckbrush Meadow.” I had long thought that the population along the Youngs Rock trail was about the only one in this part of Lane County—it is much more common in Douglas County. But it also grows on top of the cliffs along Hills Creek Reservoir, and we recently found it in what we’re calling “Many Creeks Meadow.” This meadow was also well over 3000′, so it was only just starting to bloom. While we didn’t spot any sign of old purple milkweed (Asclepias cordifolia) stalks, we still enjoyed wandering about, cavorting with friendly California tortoiseshell butterflies. We thought it might be a potential place to try starting some milkweed. It also has a nice view of the Calapooyas to the south. The deer had a well-worn path that seemed to lead to the Youngs Rock trail, so I might have to visit this meadow later and see if that is a decent shortcut to the higher reaches of the trail. 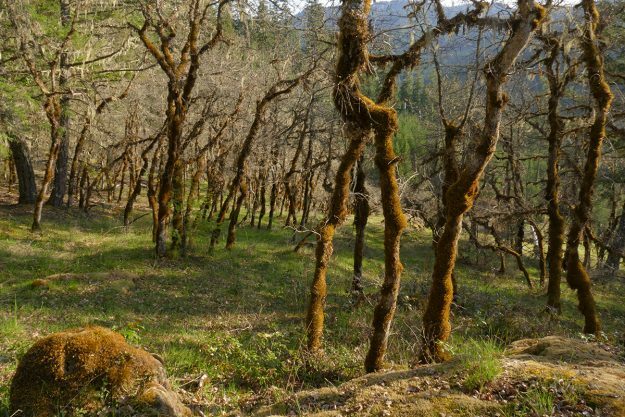 The undergrowth in the oak woods is greening up compared with the photo from January’s trip, but the leaves have yet to develop here in late April. We still had some time and were in no hurry to head home, so on our way back down Road 1929, we stopped near the bottom and headed through the woods to Many Creeks Meadow. It had been over a month since our previous trip, and it is at a lower elevation than the meadows we’d been to earlier in the day, so we expected to see a lot more in bloom. We were right—it was lovely. 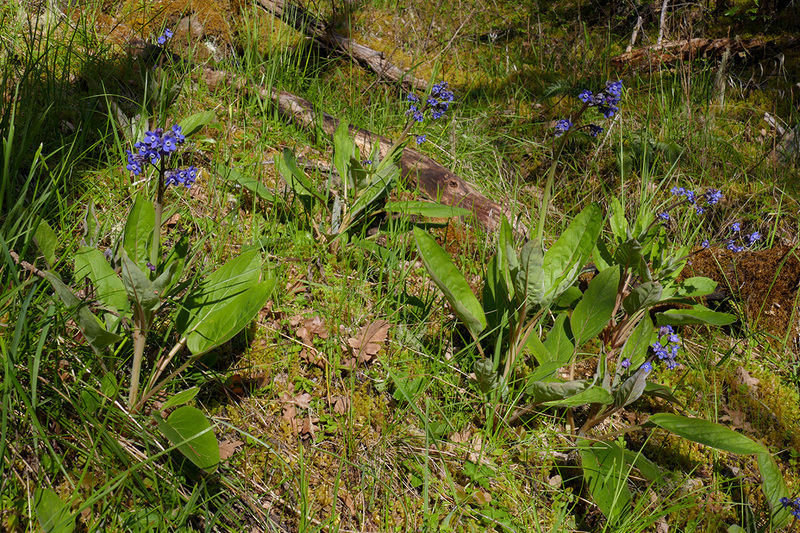 The highlight was probably the abundance of bright blue-flowered Pacific houndstongue (Adelinia [Cynoglossum] grande). This is a relatively low-elevation species I don’t get to see that often in the mountains. Also blooming well was California mistmaiden (Romanzoffia californica), Shelton’s violet (Viola sheltonii), Hall’s lomatium (Lomatium hallii), and gold stars (Crocidium multicaule). Just starting were Menzies’ larkspur (Delphinium menziesii), manroot (Marah oreganus), and the abundant buckbrush that covers the lower reaches of the meadow. At the far east end, mission bells (Fritillaria affinis) was coming into bud, and there were lovely patches of fawn lilies (Erythronium oregonum) in bloom. We added a number of things to my still fledgling plant list, including our beautiful native Oregon geranium (Geranium oreganum), whose bright pink blooms ought to appear later in May. This is definitely a spot I want to come back to again and again. The showy Pacific houndstongue, growing in the dappled light of Oregon white oaks.